RUG is one of the craft work which Afghanistan take pride in and the things in daily life. The way of use is subdivided, for example, into for meal or for prey. Sometimes, a mother and daughter weave a rug before the daughter get marry. That is, the rug is “spiritual” and “real” thing for people in Afghanistan. 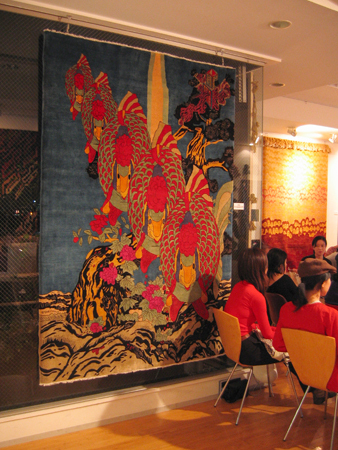 (While in Japan, it is regarded as a luxurious decoration, though). 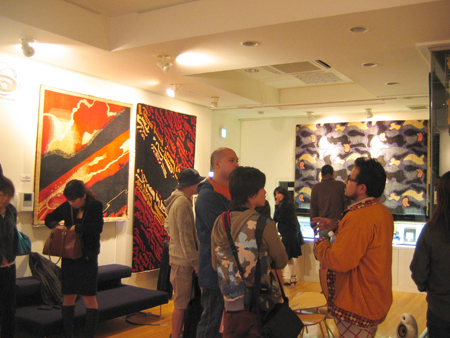 “4U RUG Exhibition” is a collaboration project of Japanese artists and Afghan craftsmen in making the rugs. Peaceful rugs with people’s wish for Afghan’s restoration are delivered from faraway Afghanistan. “4U” means “unite”, “unique”, “unison” and “universe”. There were 14 participating artists, including Tadanobu Asano, Naohiro Ukawa, Yutanpo Shirane, Keiichi Tanaami, Katsuki Tanaka, Namaiki and others. Each design was sent to craftsmen in Afghanistan and they wove the rug carefully, taking a long time. The rug can only be woven 2 – 3 cm a day so some complicatedly designed rug took a half year with two craftsmen to complete it. When you look at the rugs closer, you would understand the level of detail. One of the most difficult thing was to tell the exact pattern or colour which designers intended, because there are differences of culture or sense. When we say “red”, for example, it can be a red of sunset or a red of blood. Near the entrance, there is a work by Keiichi Tanaami. The design is using his iconic motif of a goldfish. It keeps the taste of Tanaami but some colour and texture is added by Afghan craftsman and he says “it becomes more interesting than my original design”. In a talk show with Naohiro Ukawa, Keiichi Tanaami told about the implyed meaning behind a goldfish. In the first place, he doesn’t have a goldfish and he doesn’t like it. For him, it is a strong image since he saw a goldfish in a glass tank glittering against a star shell during the war. In other words, a goldfish is an image of war for him. It might be a reason that he used in in his design for this project. There exist a rug called “War Rug” and it was actually the starting point of this project. “War Rug” is like an illustrated magazine with design which directly criticize war but the designer is anonymous. 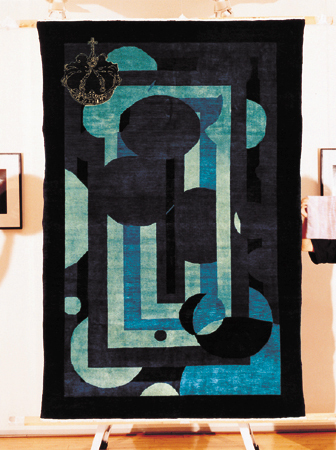 The message in the semi permanent and durable rug is delivered to the viewer strongly and creates a lasting inpression. 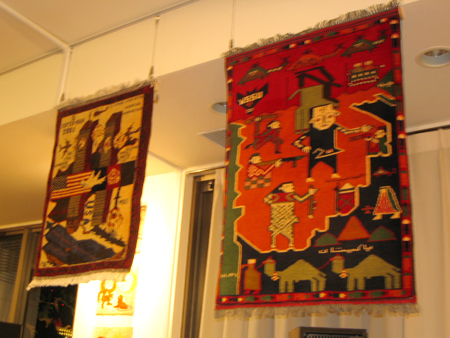 Underlying theme of Tanaami’s work is surely “a war existed in daily life” and it’s close to the one in “War Rug” which is woven in a refugee camp or somewhere. On the other hand, Naohiro Ukawa, who drew Snorkmaiden, talked about the theme of his conceptual work. How a condom is drawn by the people who lives in a place where rarely a condom is used? He attempted to express anti-US or anti-war message of people who is scared of a threat of chemical weapons paradoxically, by using vivid colour of synthetic dyestuff not dyeing with vegetables, a traditional way of Afghan rug. 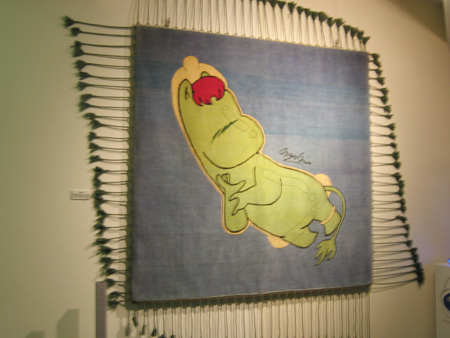 Tassels around the rug is compared to a tail of Snorkmaiden. Also it expresses antithesis against a news trend that don’t often warn HIV as other news is flooded, even if it is still prevalent. It’s a marvelous work. This work is by Yutanpo Shirane. The motif seems to be a human’s hair. His interest was to treat the rug as “a thing used in daily life” as originally it meant to be used, rather than treat a rug as complete form of art. He says “Several colours of hair, such as fair, brown and black imply the human race. I wanted to express ‘peace’ by placing them in one picture. I want to lie on the picture of a female’s hair of the peaceful countries from all over the world”. This work is by Katsuki Tanaka. This work looks like a face even if you see it upside-down. There is a funny episode that Afghan craftsman couldn’t understand the trick and kept weaving it wrongly for the first few months. 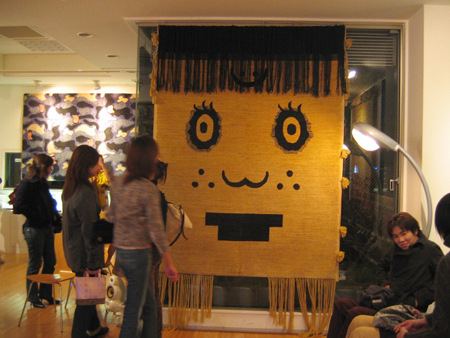 This work is by Tadanobu Asano who says “when I design a rug next time, I want to make the one in which a rug craftsman is drawn”. “I would like to keep doing the project like this. I appreciate the opportunity to work with people who even don’t know the face”. 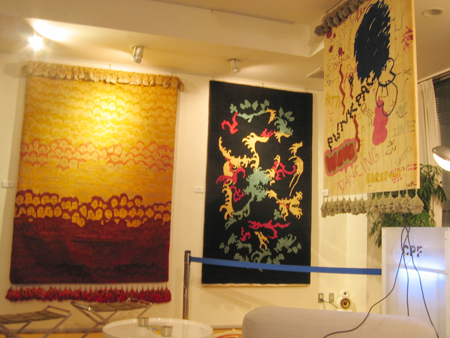 From the left, the work by Yayoi Deki, Gento Matsumoto, Wataru Komachi. In Yayoi Deki’s work, human faces are drawn with a gradation of a warm colour but a dark line is suddenly appeared in the upper middle. Maybe it’s a mistake of a craftsman. 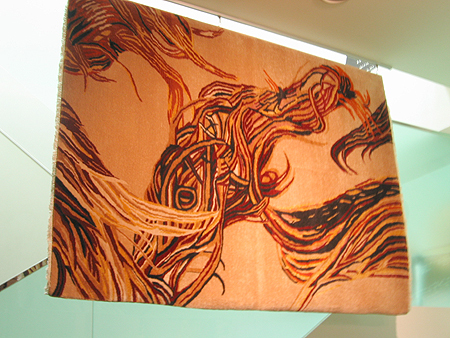 Originally, a rug is a thing used in daily life being felt and enjoyed with the four senses. This exhibition is literally an exhibition of rugs which “exhibits” them but I hope I can have an opportunity to “feel” it by sitting on or laying down on the rugs as well.